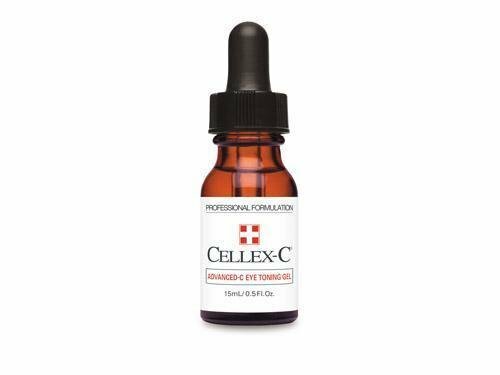 Cellex-C Advanced-C Eye Toning Gel is a lightweight, oil-free formulation containing the optimal concentration of the Cellex-C signature ingredients, 10% vitamin C and antioxidant resveratrol, adjusted for use around the delicate eye area. Regular use will greatly improve the look of sagging skin above and below the eyes, diminish the appearance of crow’s feet, fine lines and wrinkles around the eyes, and improve skin color, texture and overall tone. Water (Aqua), Ascorbic Acid, Acetyl Tyrosine, Zinc Sulfate, Glycine, Grape Skin (Vitis Vinifera) Extract, Sodium Hyaluronate, Grape Seed (Vitis Vinifera) Extract, Ergothioneine, Bioflavanoids.